Alden Besse, 93, of Vineyard Haven, died on Dec. 13, 2017, at Long Hill of Edgartown. A memorial service will be held Dec. 28 at Grace Episcopal Church, Vineyard Haven. Alden Besse was born on July 11, 1924, in Syracuse, N.Y., to Arthur Besse Sr. and Eleanor Pass Besse. At the age of 2, he contracted polio, and though it affected his left arm, the disease did not dim his vigor. The “Besse boys,” Alden and his older brothers, Arthur Lyman and Richard Waterman, were avid sailing competitors on Martha’s Vineyard, where they summered as children. Alden spent his formative years at Forman School and Brooks School before attending and graduating from Harvard with a B.A. degree in 1948. He felt called to the ministry, and received his master of divinity degree from Virginia Theological Seminary in 1951. After his ordination to the priesthood in the Episcopal Church, Alden continued his life of service in Annapolis, Md., as curate at St. Anne’s Episcopal Church. He first served as rector at St. Luke’s Episcopal Church in Altoona, Pa., starting in 1957, the same year he married his beloved wife, Barbara Ham of Arlington, Va. In 1963, Alden, his wife, and their two children moved to serve as rector of St. Michael’s and All Angels Church in Rumford, R.I., where their third child was born. Whether it was his time spent in the city of Annapolis, the railroad town of Altoona, or the turbulent times of the 1960s, Alden incorporated peace, justice, and reconciliation in all his outreach. 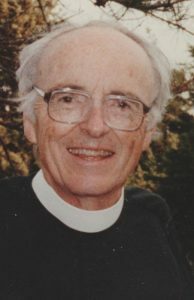 Alden’s final position as rector was at Trinity Episcopal Church in Whitinsville, from 1980 to 1989. Alden and Barbara retired to their beloved Martha’s Vineyard in 1990, but Alden’s feet barely touched the ground before he became involved with many aspects of Vineyard life. He started the annual CROP Walk to raise funds for Church World Service, worked tirelessly with the Vineyard Peace Council, was chaplain at Windemere, led the Clergy Association, and was pastoral assistant at Grace Episcopal Church, often helping at the altar and assisting or performing weddings and funerals for those who had known him for many years. Many Vineyarders felt his presence, as he called often on people in their homes, in the hospital, or wherever he was needed to extend God’s grace and love. In the Fourth of July parade in Edgartown, Alden carried a banner of peace. In retirement, Alden was often too busy serving others to have hobbies, but he did enjoy swimming in the Lagoon between March and December, praying while walking most mornings in Vineyard Haven, a “rouser-douser” snowstorm, and time with his children, grandchildren, nieces, and nephews. A brisk sail with his nephew, Steve Besse, on the Vineyard waters would bring back memories of his own early skippering days alongside his brothers. The family wishes to extend their gratitude to Long Hill Assisted Living Facility and all those who offered their support in his final days. Alden is survived by his wife of 60 years, Barbara, his children Linda Besse, Mark Alden Besse, and Ellen Besse Susman, grandchildren Jared, Audrey, and Olivia Besse, and Katie and Amanda Susman, 11 nieces and nephews, great-nieces and -nephews, and great-great-nieces and -nephews. And they shall beat their swords into plowshares, and their spears into pruninghooks; nation shall not lift up sword against nation, neither shall they learn war any more. (Isaiah 2:4 RSV). In lieu of flowers, memorial donations may be made to Grace Episcopal Church Outreach Program, P.O. Box 1197, Vineyard Haven, MA 02568; The Island Food Pantry, P.O. Box 1874, Vineyard Haven, MA 02568; Habitat for Humanity, 121 Habitat St, Americus, GA 31709-3498; or International Rescue Committee, P.O. Box 6068, Albert Lea, MN 56007-9847.